Dos Hermanos, it may come as a surprise to those who only know us through the blog, actually come from rather good Bengali stock. Our father originated in a high born Barendra Brahmin family in Calcutta and came to the UK in the 50’s ending up as a surgeon in our hometown of Rotherham. 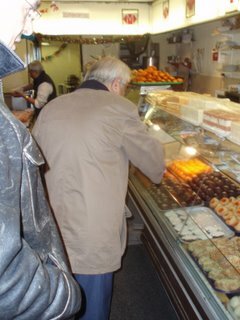 He has not returned too many times since and does not have much chance to find the foods he loved as a child. So, while he is down with us in London we took the opportunity to drag him down to Brick Lane not least so he could explain to us what some of those odd vegetables, fish and sweets are in the stores which line the street. Great fun it was too. Particularly as he was keen to explain the difference between the West Bengali cuisine and East Bengali ( Bangladeshi ) cuisine. West Bengal is primarily Hindu and East Bengal is primarily Muslim and this informs much of the food on offer. The West Bengalis love river fish like Ruhi while the East Bengali’s passion is for Hilsa caught in the salt water in the tributaries of The Ganges. 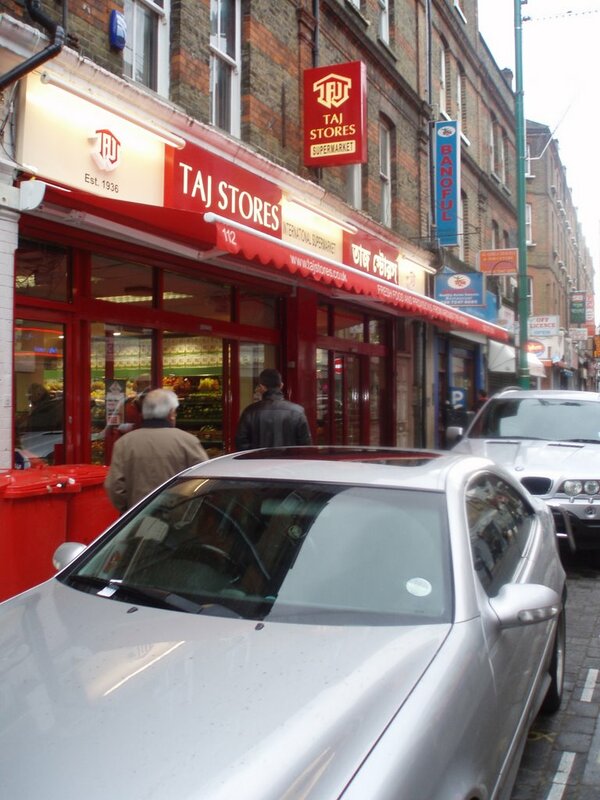 Although, most of the restaurants on Brick Lane are to be avoided, there are some excellent stores like Taj Stores and Bangla City and some very good sweet shops. What all Bengalis do have in common though, is a sweet tooth and Bengali sweets are known as the finest in India. 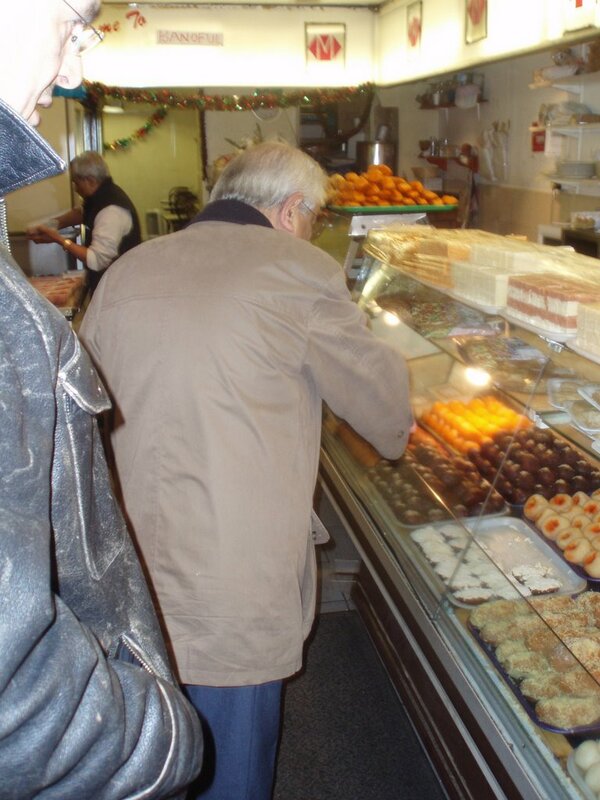 We did a bit of window shopping before dipping into Alludin and emerging a short while later with bags filled with rosagolla, gulab and mishti doi alongside some of the deep fried savouries that he was also craving, particularly shingara ( a type of samosa ) Most pleasing though was the fact that, despite his mother tongue being a little faltering these days, he was pleased to be complimented on his “posh” Calcutta accent by the sweet shop owner. Now, back home and about to indulge in the fruits of our morning’s labours and he could not be happier. Two brothers, good. Two brothers and their father, even better. As our younger sibling is down under drowning his sorrows at the pathetic attempts of the England team not to look pathetic, our father was going to be on his lonesome for New Year. We couldn’t allow that to happen, now could we? So, a short train journey later and he was happily sitting on the sofa of Chez Hermanos and pondering on a weekend of showing the young folk how this eating thing is really done. 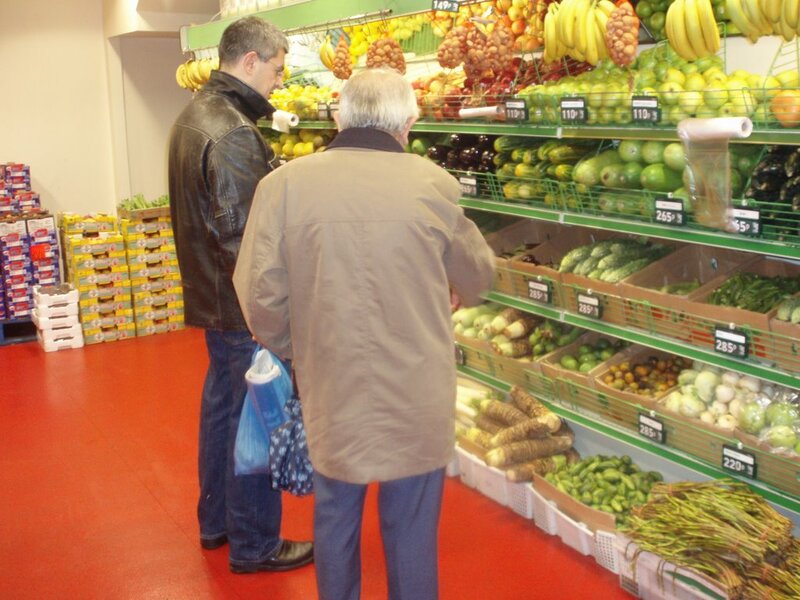 Given the presence of our respected elder we thought it only fitting that we try a cuisine from a country that is known for its respect for the more senior members of the population. Well, that could really be any country except the UK where we treat our more experienced people like crap. But, we plumped for Japanese. One of my favourite places in town when I have both the urge and the bankroll for top notch sushi is Matsuri. 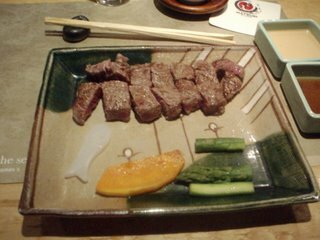 The Holborn branch was closed, so we made a reservation for the original branch in St James which is predicated on Teppan-Yaki. The room is cavernous and there must be at least 10 stations with 10-14 seats around each. It was filling up even at this early stage of the evening and the chefs were chopping and tossing with abandon to appreciative groups of families and friends. I am no expert on such things, but know a smidge more than the other two so they left the ordering to me. Foolish really because, as we were being treated by daddy dearest, I decided to do the works. To begin, a small bowl of Miso, which after the over indulgence of last night, proved hugely restorative. 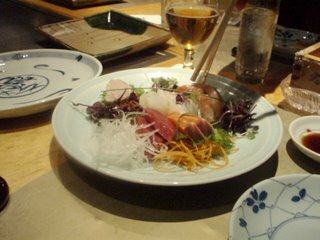 Next, a sharing plate of sashimi with superbly fresh salmon, tuna, bass, squid and sweet shrimps. On top of some shredded carrots and daikon and dressed with shiso it was a good if hardly ground breaking selection. Better, was the sushi. 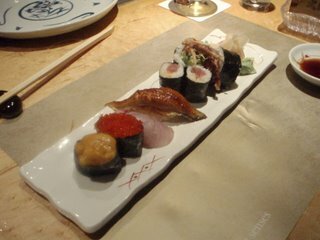 A selection of Nigiri and Maki included Uni ( sea urchin ) Unagi ( eel ) Soft shell crab hand roll and Yellowtail was exemplary but the flying fish roe hand roll was the real star and I was only too pleased to mop up my dad’s left over roll while he looked the other way. You snooze, you lose, Pops. There is no family loyalty in the food game. Next up, probably the best tempura I have tried this year. A standard selection of vegetables and prawns but beautifully made. Then to the main event. The Teppan-Yaki. 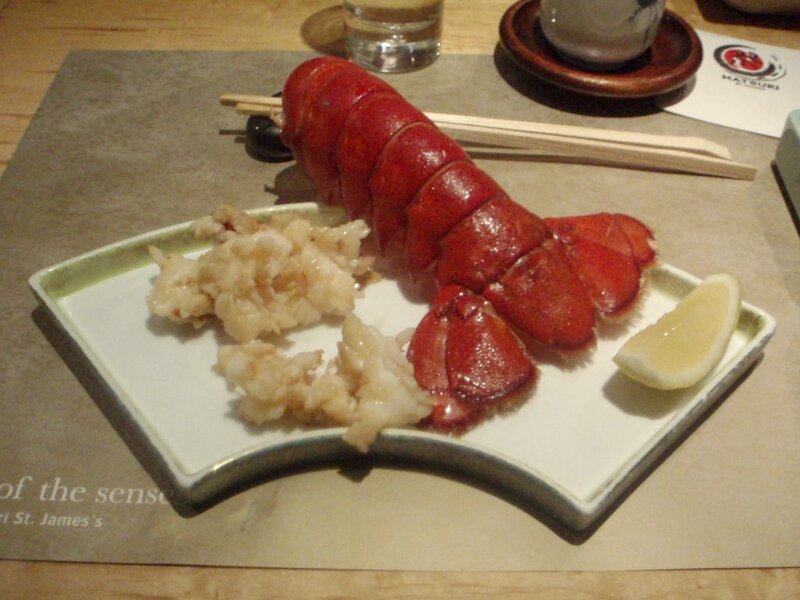 DH chose a lobster tail and sirloin steak combination while our host went for a half lobster plate. 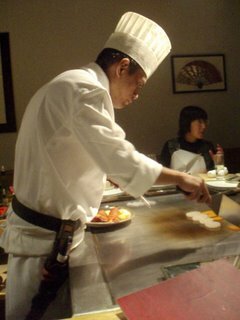 The chef did his stuff. We all “ooh’d” and “ahh’d” as required and then tucked in. Very good it was too. 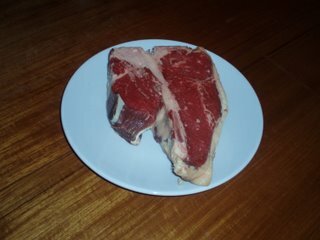 Particularly the fat from the beef which he was going to toss away but we persuaded him to crisp up for us. Well, given that we were going for the full schtick, we had to have pudding, a slightly scary ice cream “fire ball” which is as odd as it sounds and involved a few singed eyebrows. Harmless enough. With a few boxes of Sake and some green tea for me (my body is a temple don’t you know? ) I thought the bill would reduce our inheritance by a significant amount. We were pleasantly surprised. £322 for three including service can hardly be called the budget option, but for the amount we ordered, the quality of what was presented and the location we were in, it represents good value. Definitely somewhere I would consider again. So, not a bad start to the old man’s weekend and he is now sitting back on the sofa, whisky in hand and warning us that he has no intention of filling up on starters at The Angel Mangal tomorrow as it will stop him eating enough fatty lamb. It does, as you may well know if you’ve been glancing at the blog for a while, take an awful lot to persuade me to leave the safety of London, but on the very odd occasion, I do like to stir up the huskies and see where the gods take me. In this case, er, Brighton. Well, it’s hardly Bhutan, but the journey there was, thanks to the cretinous scum of Southern Railways works planning dept, just as arduous. Four hours. Four bloody hours which included an unplanned stop at a place called Redhill seemingly populated with creatures from The Island of Dr Moreaux. Thankfully, my new chum, Dawn, on whose birthday the trip was predicated, rescued me and came to pick me up just as I was about to turn around and head home. 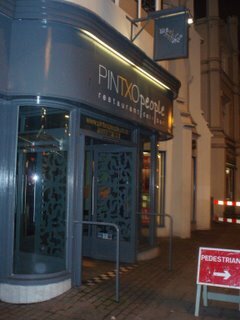 When I was pondering on places to eat in Brighton, Nick “Hawksmoor” Strangeway told me I MUST try PintXo People not least for their cocktails. Who am I to argue with a man who has never let me down yet? 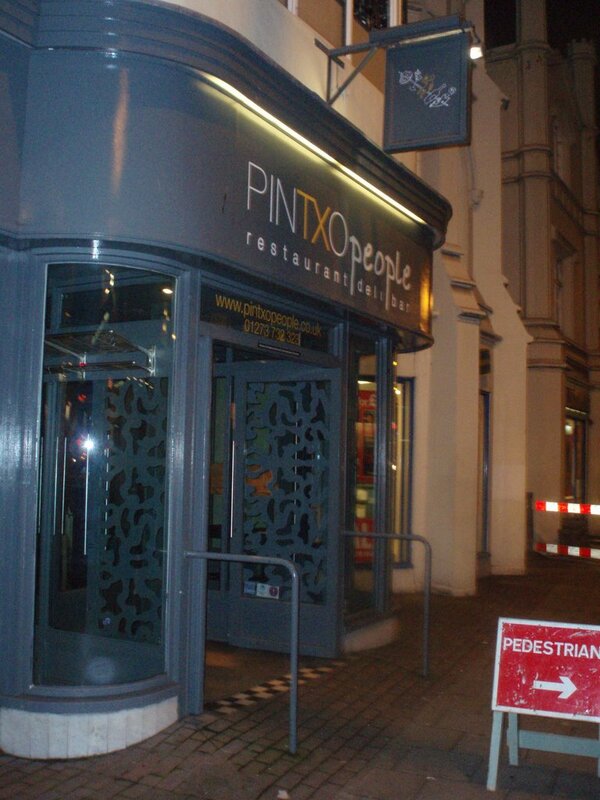 So, Pintxo People it was. Relatively new ( I think they opened in May ) PP has been getting some very good crit’ and the bar was just awarded Bar of the Year by Class Magazine. Quite an accolade for such a new place. The downstairs Tapas bar area is a great space, with its wide selection of montadito and Cruzcampo on draft, it had the feel of a modern Basque watering hole. A very good thing. Upstairs, the more formal restaurant and the cocktail bar area which is modelled on a bar in Barcelona whose name quite escapes me. 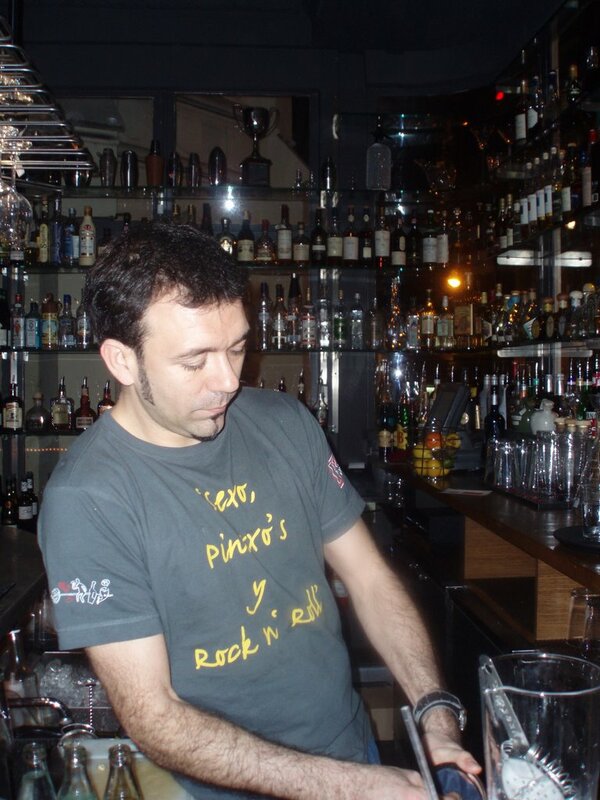 As you may gather from the many pictures of Martini’s on the blog, I am a great admirer of a good mixologist and Toby and his cohort, Marcus are amongst the very best I have encountered. Worthy of their recent prizes for sure. Passionate about what they were doing and happy to discuss what they were doing and why. 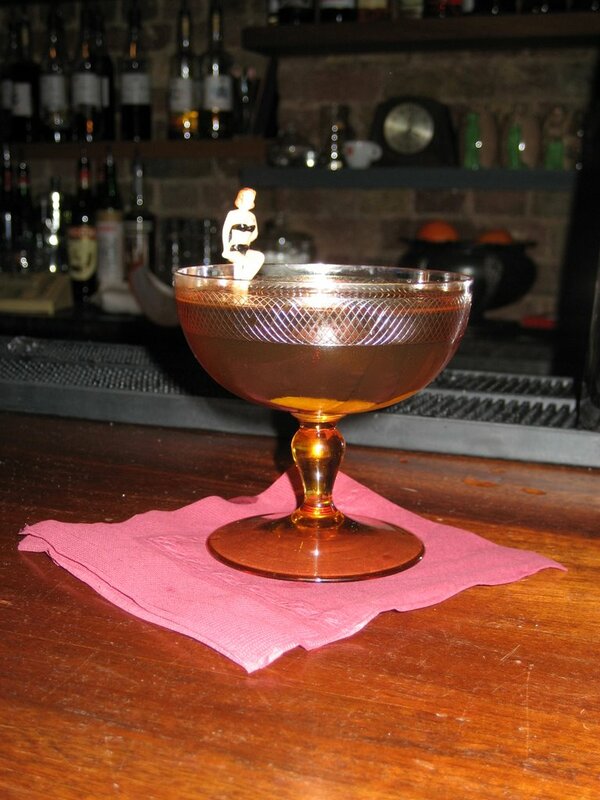 Great fun was had as they made an exemplary Martini, a Champagne cocktail made with dark, lethal, Spanish brandy. It seemed rude not to let them demonstrate their chops some more, so we followed with an equally good Perfect Manhattan and a Margarita. I could have happily sat there until I slid slowly off the stool into a well shaken oblivion. 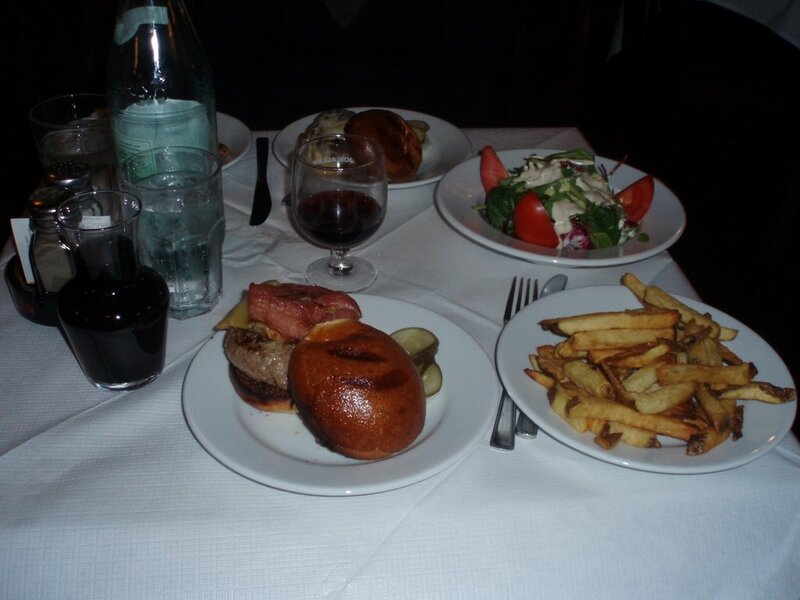 However, the stomach called and we went to a pleasant table in the darkened dining area. The food in the downstairs area is classic PintXo stuff with croquettes etc while upstairs they are producing a Nuevo twist on Catalan cooking. 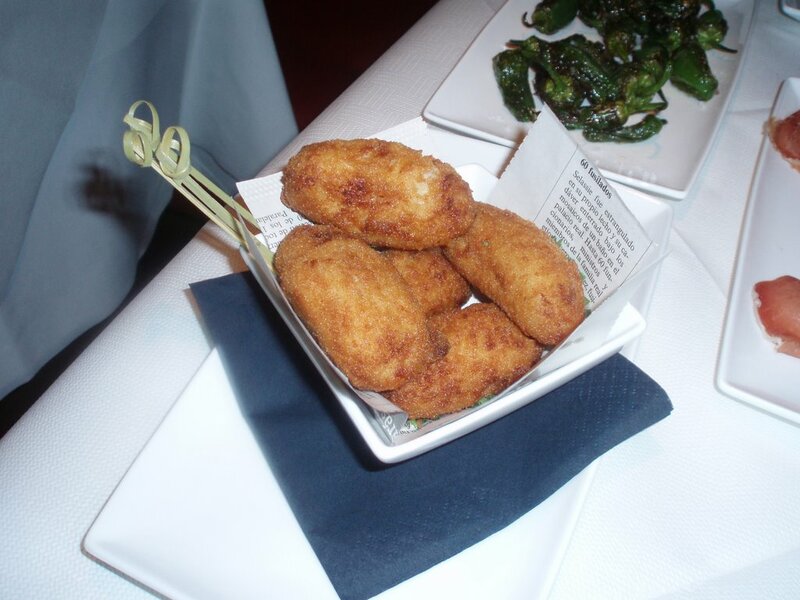 They don’t like to mix the two menus but were kind enough to let us order a plate of croquettes with our starters. Very good they were too. Dense, creamy and full of, er filling. Just as they should be. I was less convinced by the main menu. It is by their admission “experimental” but, in one or two cases is less El Bulli and more “liver in lager” ( a prize for anyone who knows where that comes from ) However. They know their stuff and the ingredients sing of good provenance. Alongside the croquettes, we ordered some Jamon Iberico Bellota. I am guessing we got about 50gms for £12 which is about average. 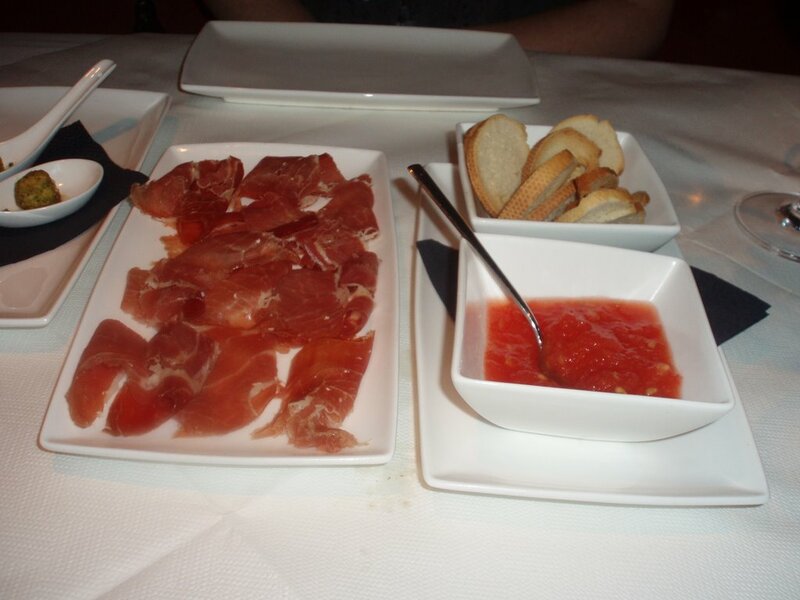 It came with some small crispbreads redolent of the breadsticks which are a staple in Spanish bars and also a small bowl of puree tomato. Jamon of this provenance never tastes bad but, this was a little dry and they explained that they had been asked to take the fat off by so many people that they now serve it lean. Madness, people who ask that should not be allowed to eat it. 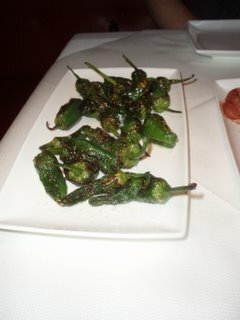 Another starter of Padron peppers was good and a decent restaurant portion for £5. It is the main courses where I think the meal was let down. 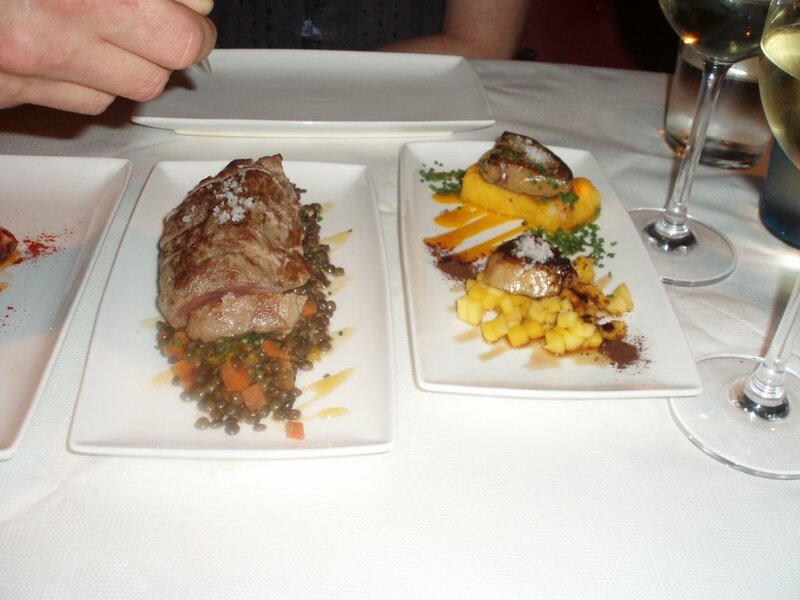 Wild boar was cooked perfectly and served on top of a stew of green lentils. That would have been enough for me but the chef had added a slice of grilled pineapple underneath which I didn’t really get. 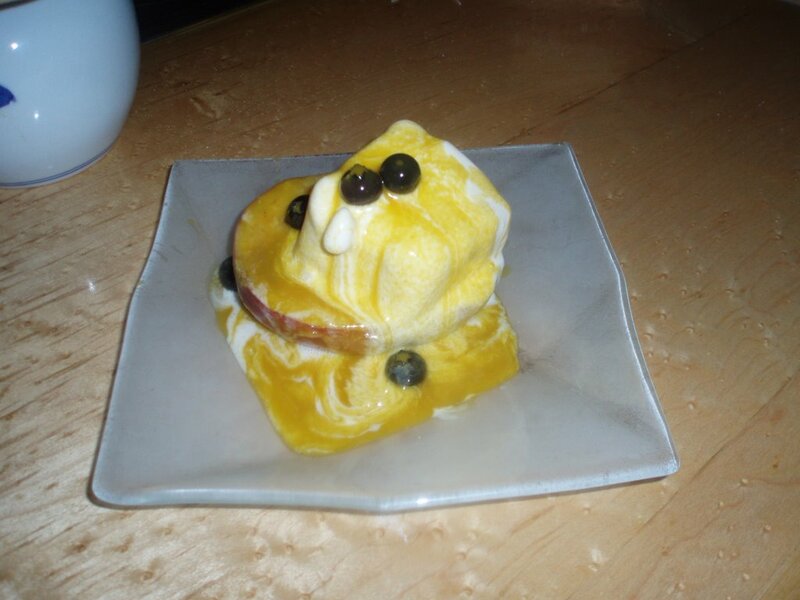 A dish of foie gras came on top of diced mango which makes sense to cut through the richness. 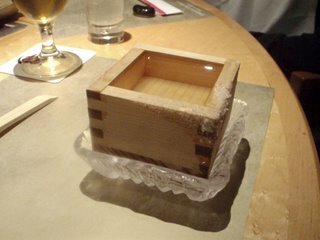 It also came with a coffee syrup. As I have an allergy to coffee (which I had forgotten to mention when ordering ) I pushed the dish over to Dawn’s side of the table and she seemed to enjoy. Graciously, though they comped me another dish without the killer bean and it worked quite well. I am not sure what the coffee would have added. More standard, was a dish of pulpo on top of “broken” potatoes. 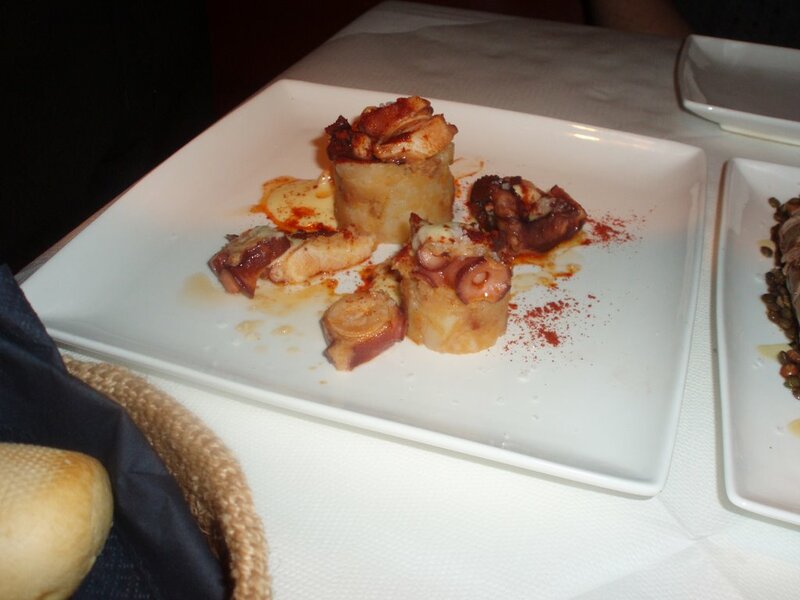 Sprinkled with paprika it reminded me of the creamy pulpo a la Gallega and was the best dish of the three. 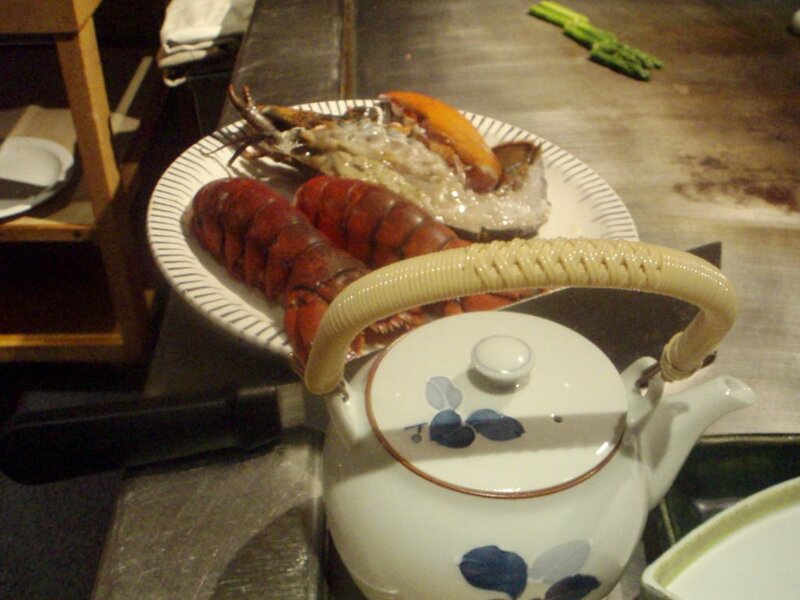 One concern is that many of the dishes came out tepid or, in the case of the boar, cold. I am not one to crave everything piping hot, but I wonder if the kitchen was struggling to keep up with what was an increasingly busy dining room. A pudding of banana parcels came highly recommended. Dawn professed to enjoy it but puddings do not do a lot for me so I only picked at it. What does do a lot for me is booze. 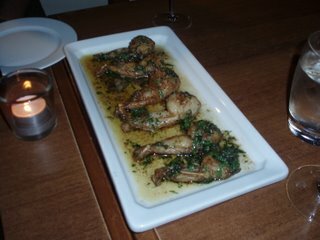 A bottle of Rueda was well priced at £22 and worked well even with the richer dishes. As if we were not pickled enough, a glass of Cava rose was presented for Dawn’s birthday and then followed by two flaming after dinner cocktails which was enough to send us reeling into the night air. Service throughout was exemplary and hugely friendly. Jason and Bruce who run the place obviously know how to maintain a slick operation. Despite a few quibbles about the food, this is a place I could find myself visiting on a very regular basis if it were closer to home. The good news is that they are pondering on a branch in London’s fashionable East end and I can certainly see myself being an habitué when the need for decent tapas gets too much to bear. Inevitably, this morning, we were feeling a little sorry for ourselves. 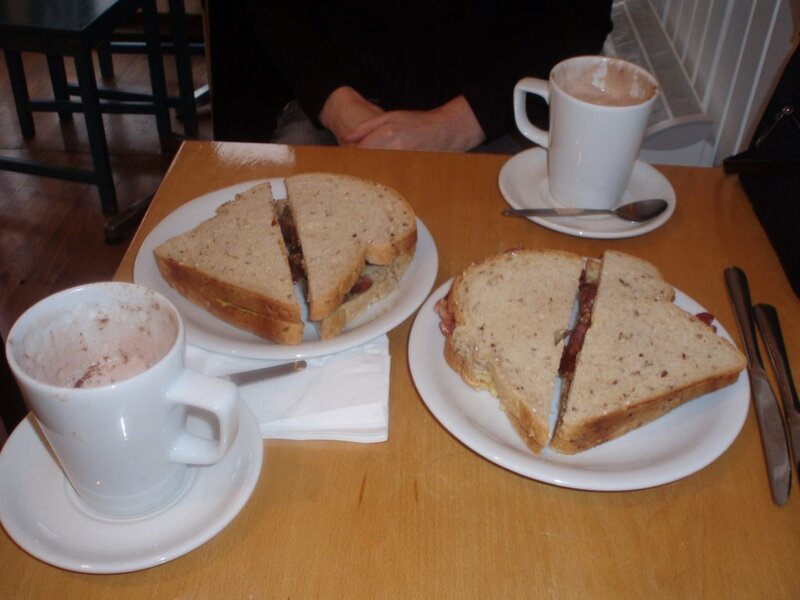 So, a bracing walk along the front to The Lanes gave us the chance to pop in and take a dose of what every sane nutritionist recommends to perk you up, a sausage and bacon butty. stuffing the turkey. 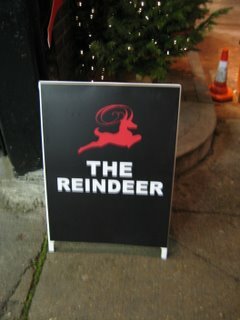 So when some friends told me they had got a table at December's hot ticket The Reindeer I was very happy. 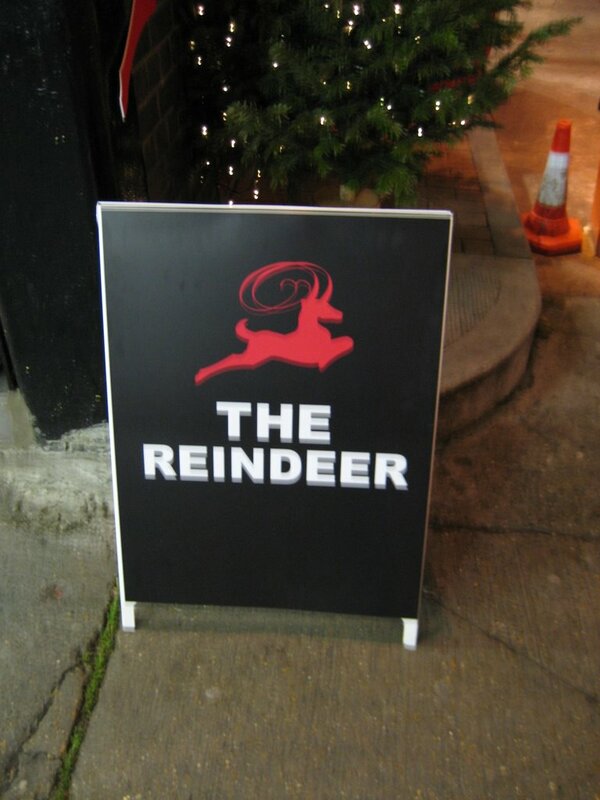 The Reindeer is a one-time only Restaurant and Theatre event which has been running since the beginning of December and closes just before Christmas when all the fixtures and fittings will be auctioned off. 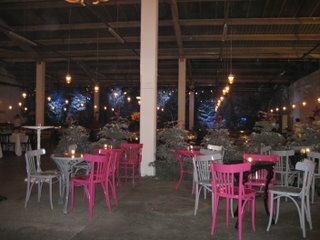 It's on the floor above Spitalfield's Upmarket and had been done out like Santa's Grotto, all pine trees, log cabins and glittery stuff. I was a bit disappointed then that I never got to see the man himself although I did meet one of his pixie helpers at the entrance and very comely she was too. I was the first to arrive so I got into the spirit of things with a few glasses of champagne while grooving to the pianist playing pop hits restyled as cocktail lounge tunes. 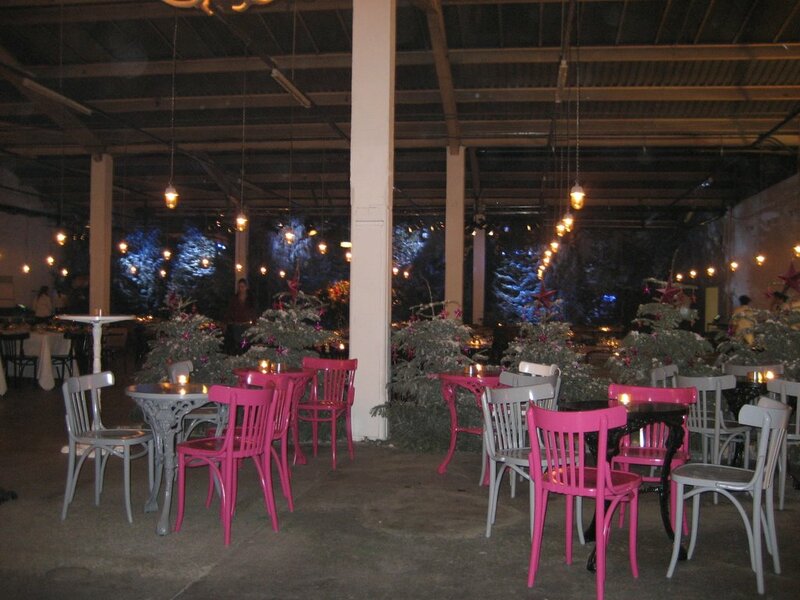 For a temporary restaurant above a car park the food was pretty good (as the head chef was from Bistrotheque I expected as much). 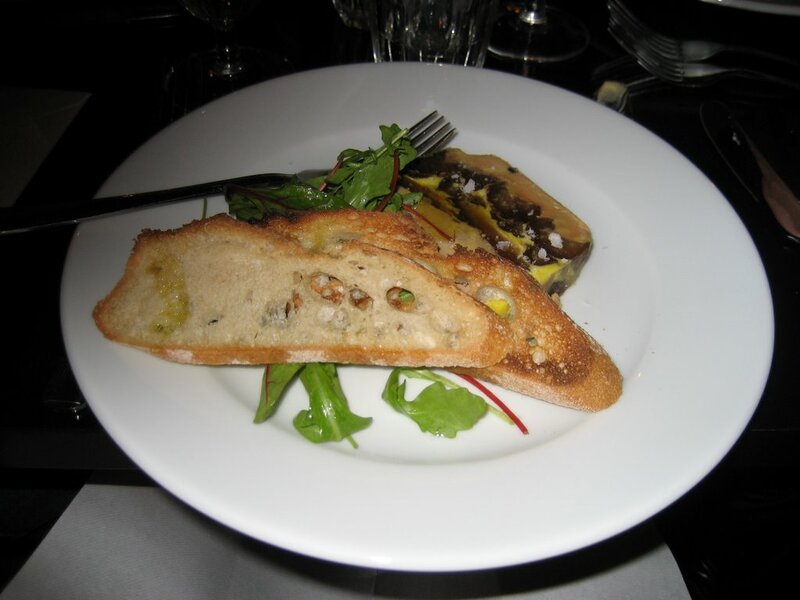 Decent bread and butter preceded a terrine of foie gras which was rich and dense and didn't stint on the liver and there were some rather good looking scallops as well. 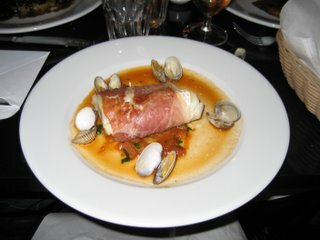 It doesn't happen too often but I went for the fish for the follow-up: a lovely tranche of haddock wrapped in parma ham served with some cockles and a bit of sauce. 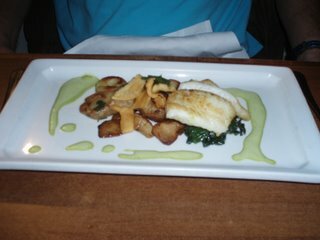 The fish had been cooked perfectly so that it broke up in flakes rather than mush. 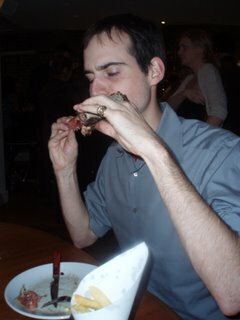 I had a taste of some rather good rib steak served on the bone and some slightly relentless risotto. I finished off with a very alcoholic individual trifle. 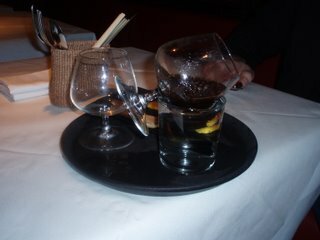 They even managed to come up with a good double espresso and a glass of grappa. Service was excellent as well although the bar manager did confess to me that people were starting to flag a bit as the restaurant's run came to a close. Afterwards we moved to Hawksmoor where we had a couple of rounds of well-made (as always) cocktails. My friends had trains to catch so I stayed on to talk and have more cocktails (take a bow Jorge). It was late when I eventually left and as I made my way down the quiet streets I heard something above me. There was a basso profundo chortle punctuated by what I can only describe as sleigh bells. I looked up. The skies were empty. One too many cocktails, I suppose. I shoved my hands deeper into my pockets, quickened my pace and continued my journey home. PS And I didn't use the phrase "guerrilla restaurant" once...damn. I don't often write about things other than meals, but, on occasions I come across people and places in this crazy old business we call blogdom who really deserve all the credit and publicity they can get. 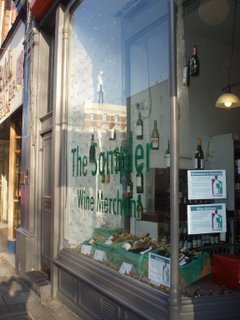 Such a place is The Sampler a new wine merchant on Upper St. 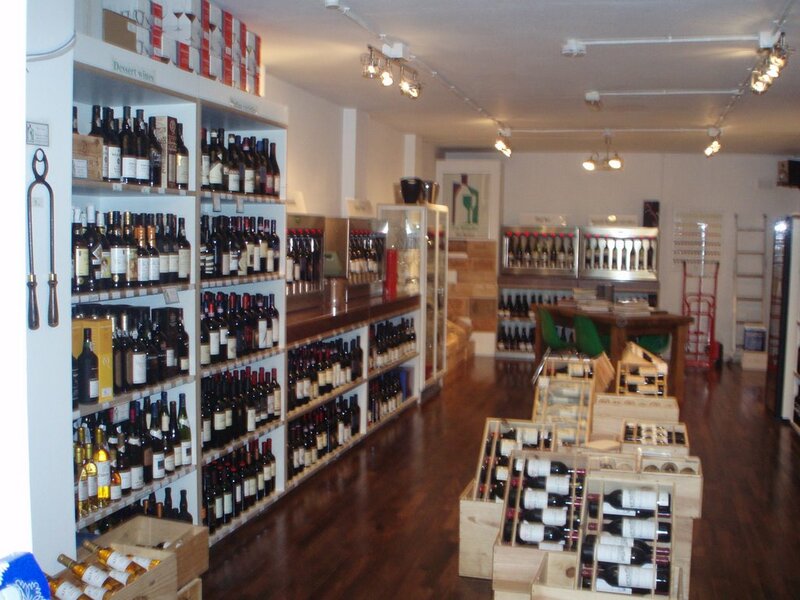 This however, is no ordinary wine merchant. It is equipped with dispensing machines from a company called Enomatic in Italy. They have only made 150 of them to date and the Sampler has 10 of them. 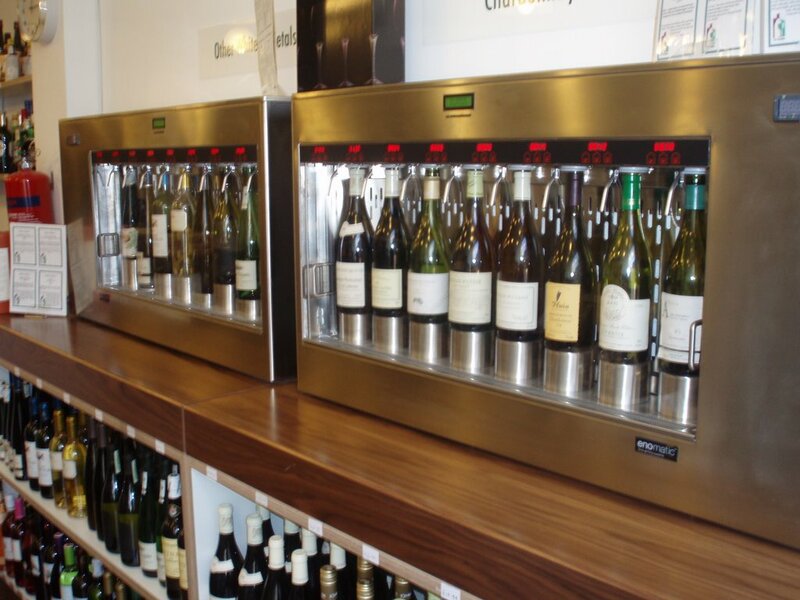 There is a small area for glasses and a sink to rinse between tastings while the machine is triggered by the insertion of a pre-paid card which can be topped up as needed and lasts for twelve months. 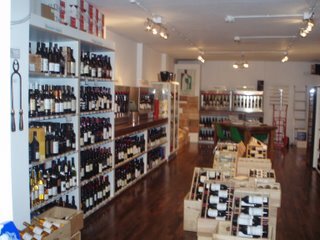 A truly splendid idea and one that is made even better by the interesting, unusual and varied selection of wines which are displayed by grape variety so one can compare new and old world interpretations. 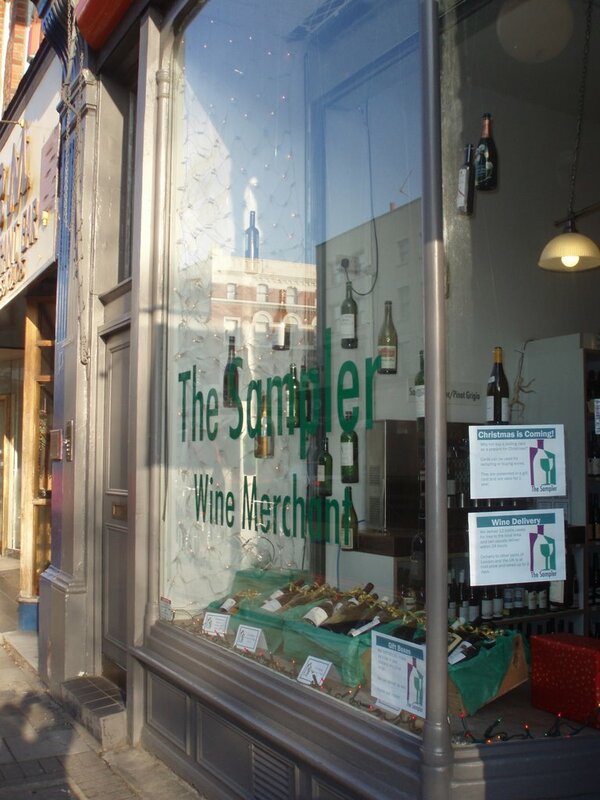 Also splendid are Jamie and Dawn whose nascent enterprise this is. Their passion comes through and they are pretty good salespeople too as today's lunchtime excursion proved. 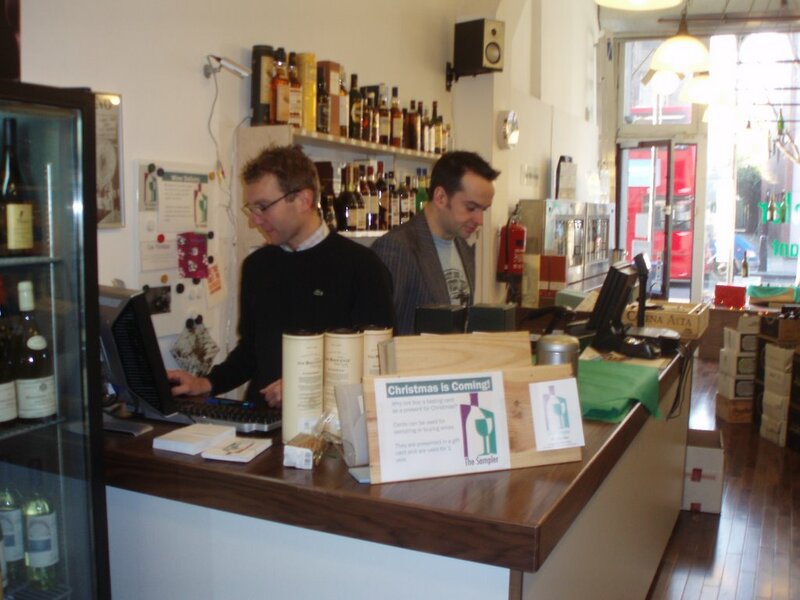 I had bought a colleague a £10 card to help sate his passion for Barolo and we headed up for a little lunchtime bevvy and exited a happy hour later having tasted seven wines ( in small measures so it added up to just over a glass in total ) and bought about £100 of wines between us. Some of them at the enthusiastic insistence of Dawn who was minding shop. Well, it is that time of year when we start to reflect on the meals of the past year and ponder on how much we drank/ate and spent. There are often tears involved. I cannot speak for Hermano Primero but, when it came time to think of my plaudits and brickbats, there really could only be one winner. Certainly, there have been some great meals this year and some places that have really struck a chord. Take a bow Theo Randall and Vinoteca. However, all of these splendid places have to kneel at the feet of my current favourite place in London HAWKSMOOR. Someone posted a comment the other day saying that I constantly eulogise about this place. But, look at the pictures and then tell me how you could not. Last night, I had supper with my dear friend, Martina and, as she had not been inducted into the joy that is Hawksmoor, I decided it was the ideal venue. The blessed Mr Strangeway managed to make space for us despite the Christmas mayhem and proudly came out with a plate weighed down with a 28 day aged T-Bone from The Ginger Pig which he had sourced for us. One look at this 1kg of cadaverous perfection made me realise that my elfin companion would be scant use in its demolition. So, we made an emergency phone call and managed to track down her significant other who cancelled his other plans at the mention of steak and came and joined us. Starters came and went and very good they were too. A decent Caesar and some excellent char grilled squid. But, that's not what it is all about. It was all about meat and lots 'O it. And what a piece of meat. Perfectly prepared, rare with an excellent char. 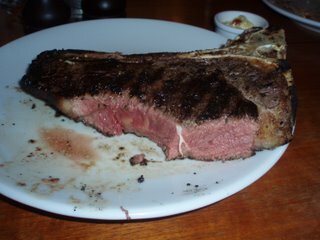 I can not recall a better steak in recent memory. 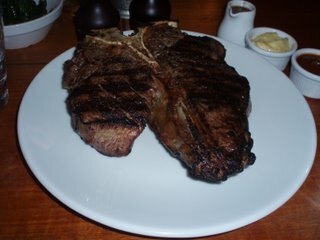 From the moans and squeals uttered by my companions, they were either doing something altogether unhygenic with their feet under the table or enjoying the steak just as much. Much better was a bottle of Stag's Leap which Nick just had to open and pour us each a glass. A bit of ice cream action to follow and a couple of post dinner cocktails made by Lucas and Jorge ( The best mixers I have encountered in London this year by a country mile) and it was all over. The only downside of enjoying a place as much as Hawksmoor as much as I do is, that at some point in the future it wont be there and, though I am sure that will be years in the future, I am still not quite sure how I will cope. A few weeks ago, Hermano Primero visited J Sheekey. He has not written about it yet for reasons I can only put down to mediocrity. On their part that is, not his. 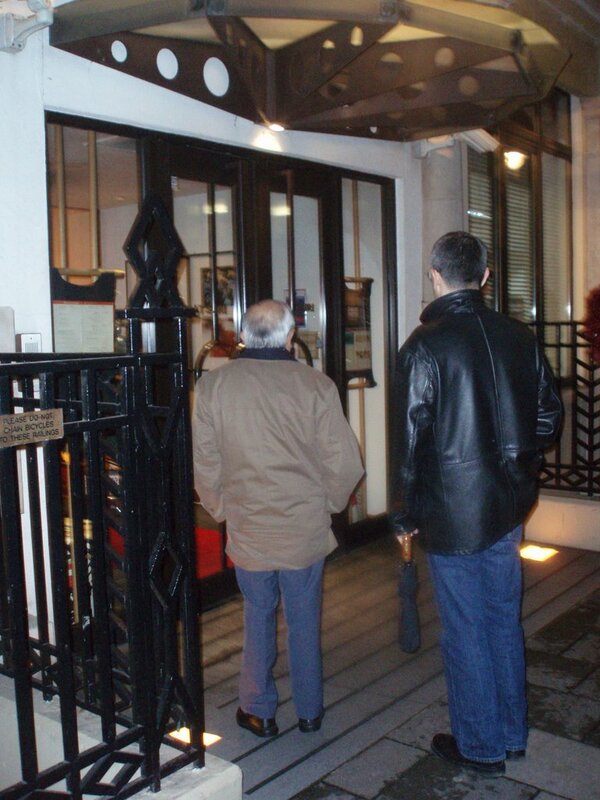 That being said, when HP went to visit a few weeks ago he had an enjoyable meal and, as I already had a reservation, I thought it may be the place to have supper with my good chum, Susanna. I arrived early and was shown to a table in Siberia as far away from Paul Burell and Richard E Grant as it was possible to get without being in the uber swish bogs. Service though was friendly and I ordered a Martini which came in a measure so small I am surprised it did not evaporate on the way to the table. Horribly made too. Some bread arrived which, while not being close to that I had recently at Locatelli, was pretty good and served with some fantastic green olives and excellent olive oil. By then, Susanna arrived and ordered a Manzanilla which was served at room temp which is pretty pointless and careless. Why have it on the menu? 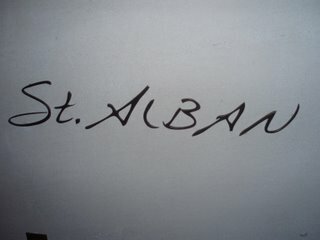 Considering the location and the provenance of St Alban, the prices do not at first seem horrendous. However, when you sample the food you soon realise why. If they really charged any more for food this ordinary they would be ridden out on a rail by the B list celebrity brigade of London. It really is that blah ranging, in fact from ordinary to down right, well, yuk. For Susanna a starter of a small bowl of shellfish which included three razor clams, some non descript mussels and a few palourdes. Nothing here showed any indication that it could not be cooked in the home kitchen much more accurately. 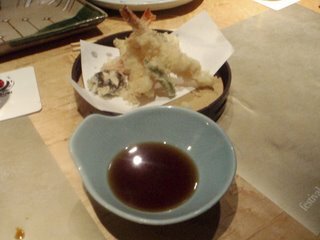 My starter was “ crispy deep fried squid with a green mayonnaise” Deep fried it certainly was. Crispy? Nope. The green mayo was tasty enough but for £9.50 you would have thought they could at least get a staple like this right. Apparently not. Main courses were scarcely better. 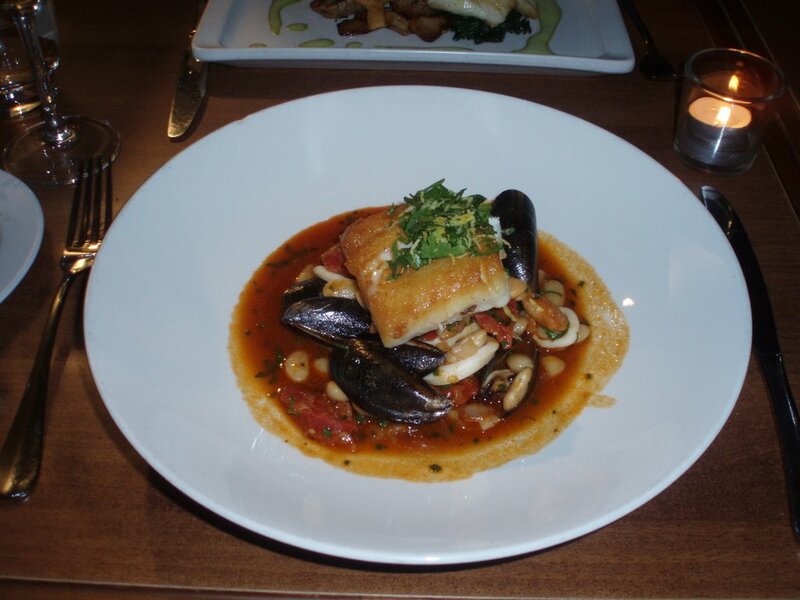 Susanna ordered one of the more expensive main courses which was a sea salt baked sea bass. Much show was made of removing the salt crust. If only as much attention had been made to getting a decent ingredient. As bland as bland can be. Worse was my “ wild rabbit stew” If I had been cooked this badly, I would have been fricking wild too. Quite awful. The meat was stringy and dry and showed not inkling of having been cooked in a stew. It was white throughout. It came topped with a fierce reduction and a few onions of such acidity I thought they had been served by Kenneth Williams. Somewhere on the menu, in letters so small you needed to have a magnifying glass they offered “ Potatoes, Vegetables and Salads” as a side. I had not noticed them and had not been asked if I wanted them, so was surprised when the dishes came with nothing to them but the main ingredient. Susanna asked for and got a bowl of spinach. I notice, now, on looking at the bill that we were charged £5 for it. Apparently they have found the secret for turning spinach into gold. We were still hungry enough to need pudding and ordered a place of Picos cheese with honey & country bread a pistachio ice cream with a zabaglione sauce. Nothing to report here. Except that a waiter turned up with our tea and coffee before our pudding and seemed most disconcerted when we told him to take it away. The puddings were unmemorable and the coffee and tea, when it did arrive at the right time came with some truly terrible macaroons wrapped in cellophane like little sweeties. 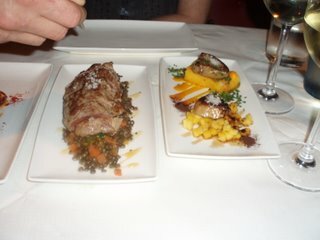 With a very decent bottle of Albarino and a glass of Priorat the bill came to £153 for two which included service. Let’s stop to think about the service for a moment. It has always been the thing that helped this group stand apart from the crowd. 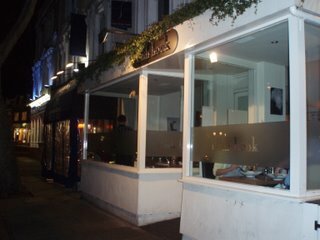 At Sheekey’s and even The Ivy with its silly booking policy, you could always depend on attentive service throughout your meal. 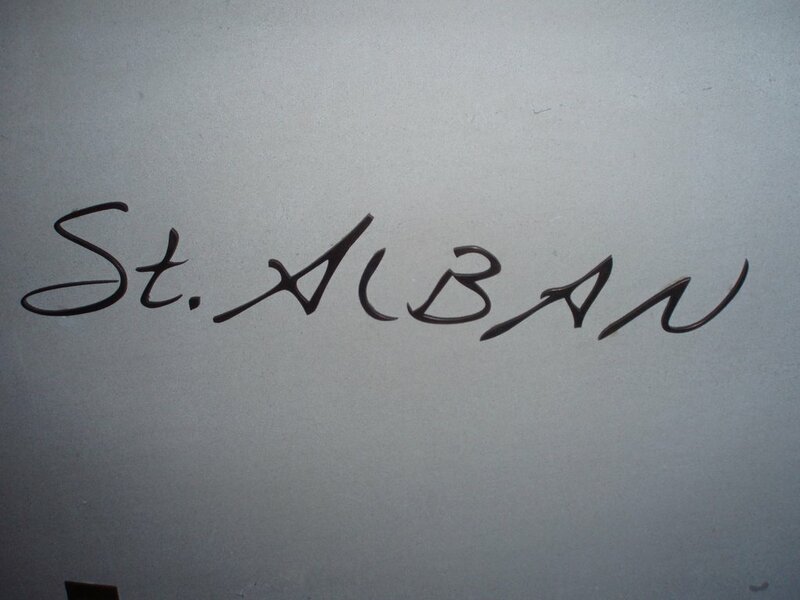 Not so at St Alban. They are obviously going for a new record trying to see how many servers can deal with one table in a single evening. I counted at least sixteen different people who came to visit us. From the guy who brought the first bowl of bread to the woman who brought the bill. This includes a man who came to crumb the table who was supported by another who held a place into which he could brush the crumbs. For all of this manpower and hustle and bustle, the service was as inept as I can remember. They could not recall which wines we ordered ( simple trick, write the buggers down ) they brought the wrong wine by the glass. They brought the tea & coffee before pudding even when specifically asked not too and there were more examples. 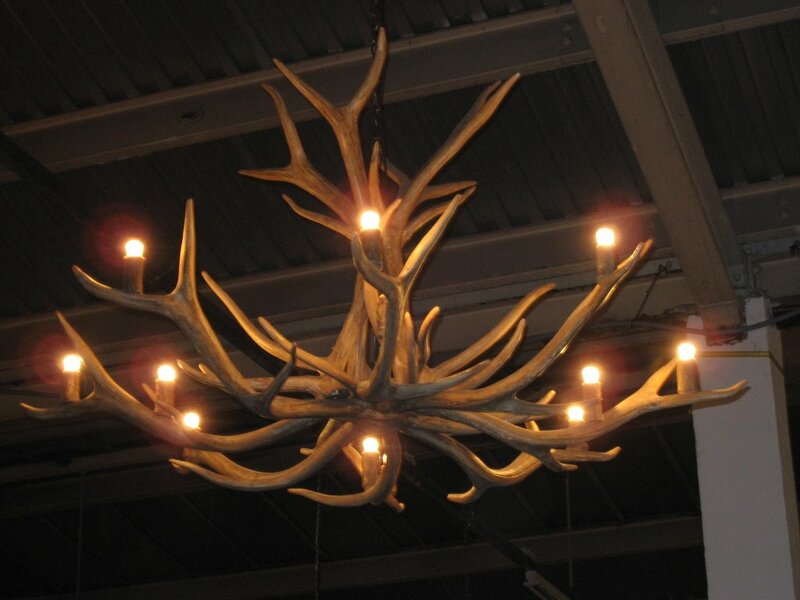 The last thing you would expect from a restaurant in this stable is for the service to be so laughably inadequate. Mind you, so was the food so I guess it hit a balance. I think I will leave this place to Richard E Grant. Not so much Withnail & I as just Withnail.
" A fish restaurant? On a Monday night? In Chiswick?" Not the most promising offer of supper I have ever had and my mood was on the gloomy side as I squeezed my ample frame onto the tube and headed West. I couldn't help thinking " I don't go this far for my holidays"
It really is a different world once you step outside the safe enclaves of London's fashionable SOSHO. People are strange, more pasty looking and frankly, quite scary. The further West you go the more frightening it gets. So, you can imagine, by the time I got to Chiswick I was almost a quivering wreck. It takes a lot for me do an "across the Andes by frog" expedition these days, but supper with my good chum Nick is one of them. Fish Hook was his suggestion. I recalled it vaguely from when it opened a few years ago as Fish Hoek where the schtick was offering a wide variety of fish from South Africa. Well, unsurprisingly that idea failed to fly among the good denizens of nowheresville and, about, a year ago, it changed hands. And it shows. For, although this is a small, unassuming neighbourhood joint. It has the overriding sheen of a true professional. 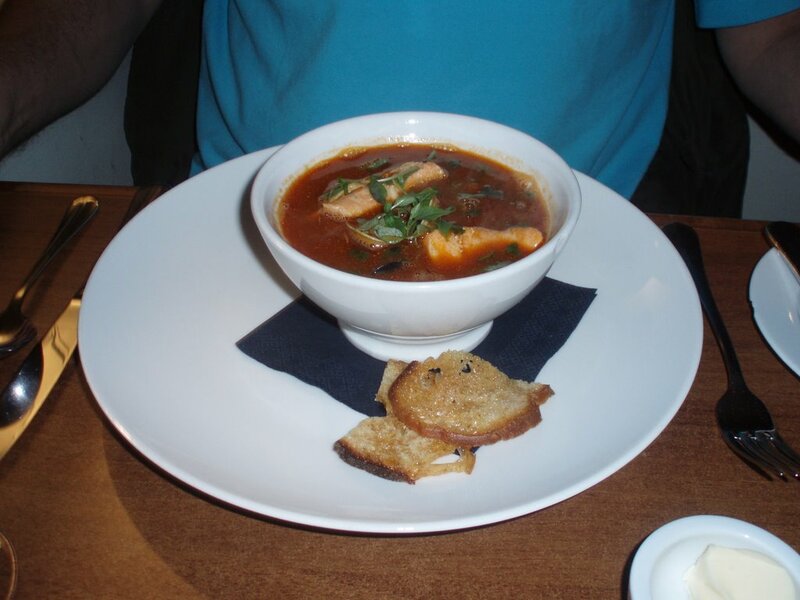 After a small glass of champagne to kick things off I dragged Nick kicking and screaming into the Dos Hermanos " three starter" hell and her ordered a fish soup with shrimps, clams, octopus, mussels and other bits and pieces. 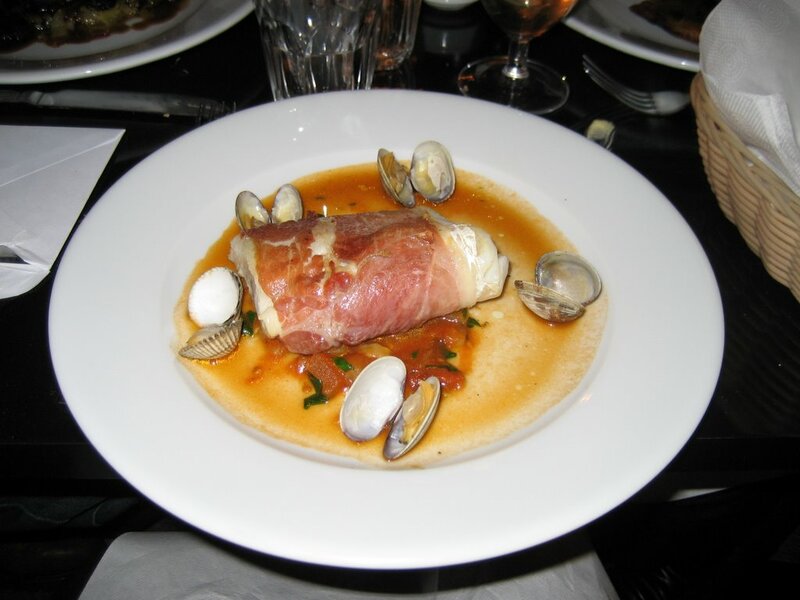 I did not try it but Nick acclaimed it the best he had eaten in a long while which is a lot to say for a man who spends as much time as he can in France. My starter was not up to that but still pretty good. 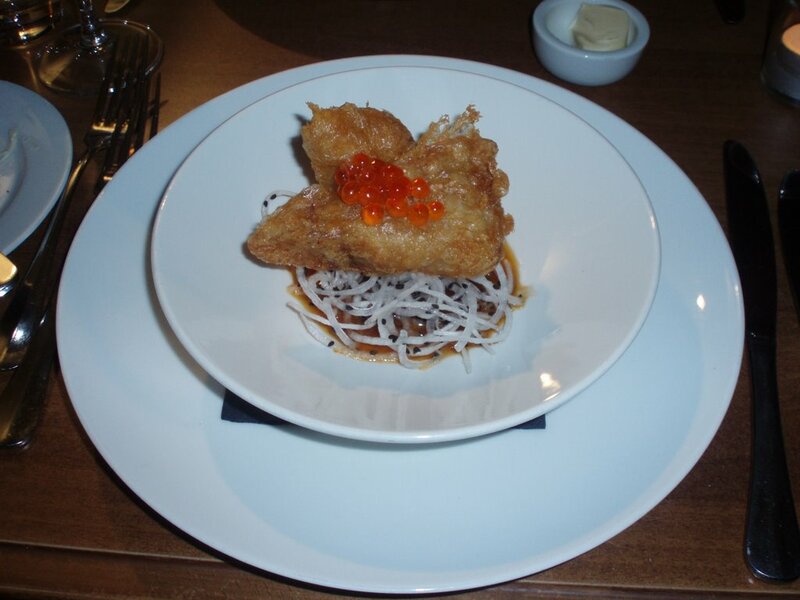 A crisp Mahi Mahi tempura with a daikon salad and salmon "caviar"
Best of all though was a small tray of frog's Legs which had been sauteed with butter, parsley and plentiful amounts of garlic. One of those old school dishes that never fails to please and, as Nick and I decided a long time ago that we were never going to end our evenings with a tender snog, I was free to ask for a spoon to ladle the sauce into my waiting mush. It was good to see some more of the more unusual suspects on the main course list and Nick chose wild brill with potato gnocchi, ceps, roasted jerusalem artichokes and parsley. Again, Nick seemed to enjoy and was sorry he had chosen the smaller portion rather than a proper main course. 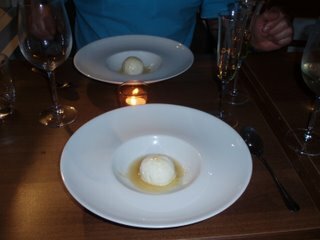 As indeed, were two plates of Greek yoghurt and wild honey sorbet which came with two small glasses of dark grappa to pour over. A nice way to finish a simple meal. I was being treated which was, er a treat so I have no idea what the bill came to. 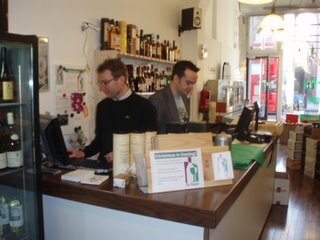 I do know that whatever was added on for service by them or by Nick was well deserved and it also included a well priced bottle of gruner. The journey back was the stuff of nightmares as the tube was packed with young folk in badly fitting clothes hurtling East to Farringdon to be part of the Fabric experience. Despite that, I can almost imagine myself suffering through this round trip again to sample some of Michael Nadra's cooking and that should tell you all you need to know. Different cities look better in different lights. Paris in the Spring, Madrid in the bright sun of Summer, New York in the fading light of Autumn and London, ah London. It is never better than in the weak, watery sunlight of early winter. I think it is to do with the stone from which so much of the city’s buildings are hewn. Whatever it is, there is no time better in which to marvel at the greatest city on earth. Today, I was joined by my newest chum, Dawn as I perambulated around the city on what soon became a route march from East to West End. 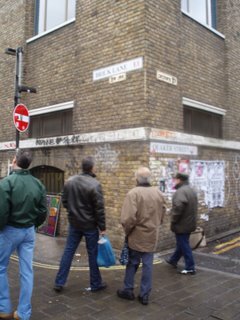 First, of course, Brick Lane and Choc Star where the lovely Petra was sitting shivering in her mobile box of delights. Splendid as usual and the spicy shot of Venezuelan hot chocolate was just enough to take the edge of the memories of last night’s parties. 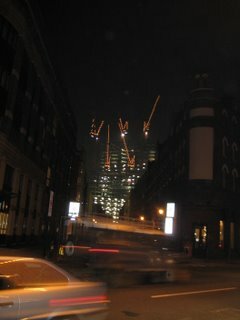 Then a long walk down through Spitalfields, to London Bridge and along the South Bank. The Frost Fair was in full effect and, a walk that normally would have taken about 20 minutes took nearly an hour. 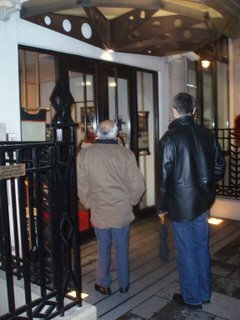 By the time we crossed over towards Embankment tube, I was ready for a drink. 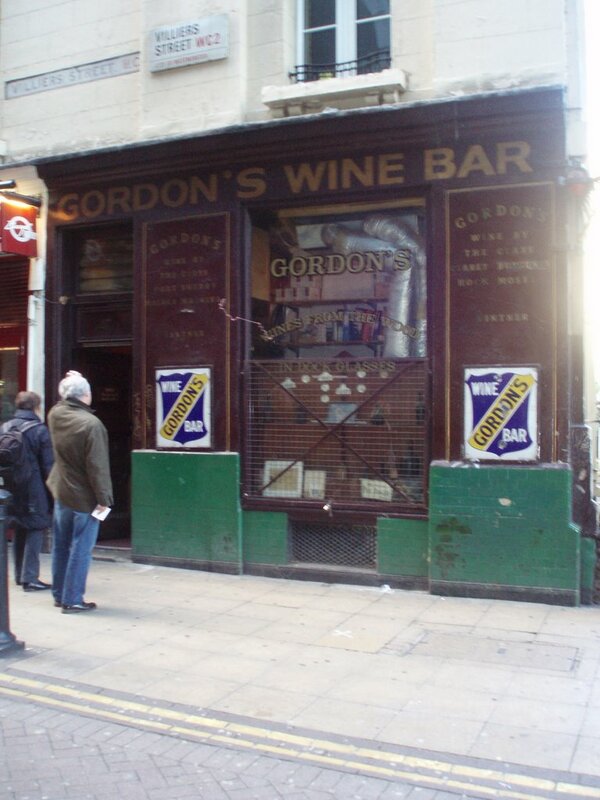 Fortunately, the bridge deposits you right by Gordon’s Wine Bar on Villiers St. One of the great treasures of London and yet one of those places that so many people I know have never encountered. 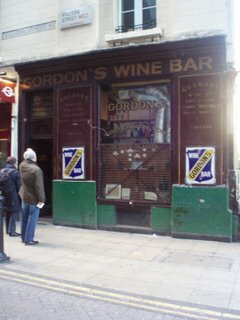 I think it opened in the late 1800’s and has remained pretty much the same ever since. 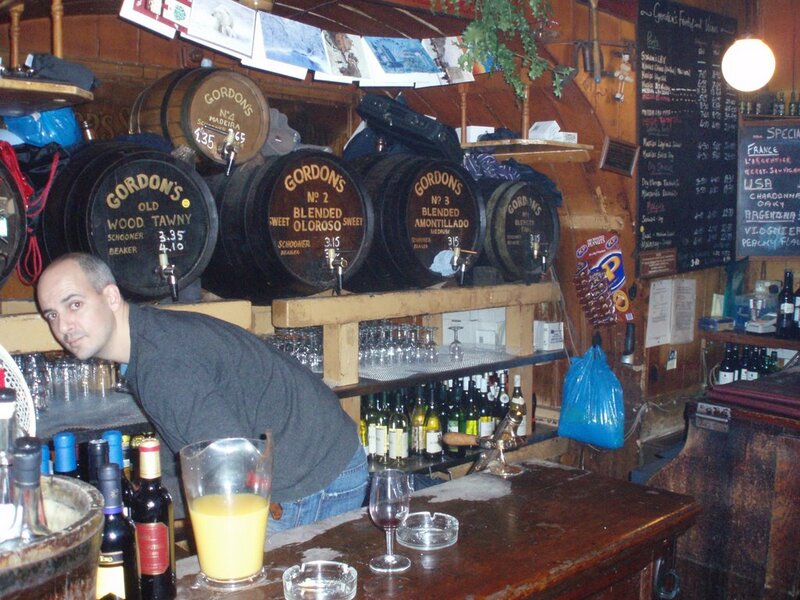 In many ways the London cousin to La Venecia in Madrid, it is famous for its barrels of sherry and its impressive list of wines. By 1.30pm it was filling up with people wanting, for some reason, to eat the grim food, but we found a spare table and sat nursing a couple of drinks while we decided what we wanted for lunch. For reasons I cannot explain, I suddenly thought of Joe Allen’s. 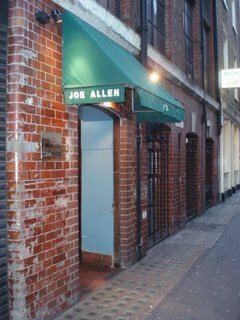 It has to be nearly five years since I set foot in the place, but it inhabits a fond section of my memories as I used to be a regular there with friends and potential girlfriends when I first came down to London in the 80’s. 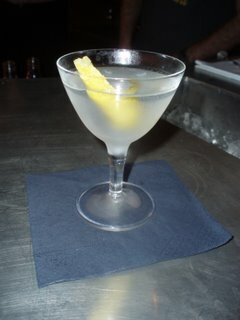 They were always capable of making a decent Martini and the food, while not breaking any new ground was pretty consistent. What’s more the burger ( not on the menu but always available to those who ask ) was one of the better ones in town. 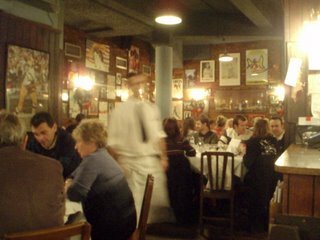 Although the place was packed and buzzing and we had no reservation, they found a small table into which they squeezed us while we perused the menu and took in the theatrical posters from ages past. Joe Allen is not somewhere to try and finesse the menu and much of the list is to be avoided. But, stick to the basics and it does the job. A Caesar salad was well made and blunted what was, now, a sharp appetite. 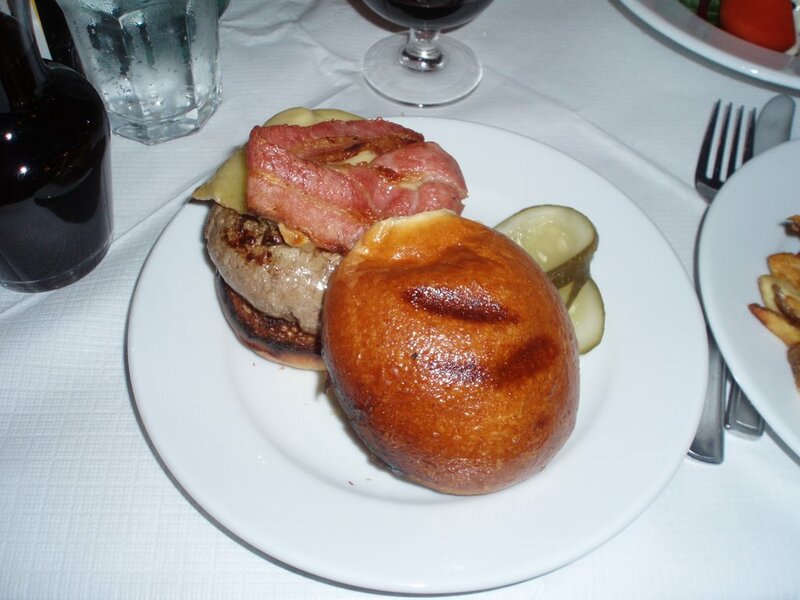 The burgers were as good as anything you are going to get in the city. Served with some bacon, some sharp cheese and crunchy chips, it is decent value. As indeed is the offer of wines by the 25cl pot from which I chose a fruity Zinfandel. Stuffed and unable to face pudding, they aced the mint tea test and brought me the bill which was £60 inc service which was amiable if harried. Nothing in either place that would find itself on a “ best of “ list, but it was nice to find myself visiting a couple of this city’s institutions on a day when the blue Winter sky ensured London has never looked more lovely.